With our main operations located near by to Westmeadows, Ultra Bin Hire and Demolition are your local experts when it comes to demolition services and your choice for skip bin hire in Westmeadows. We offer our services to residential and commercial clients for all sorts of projects with years of experience we are equipped and able to handle any project. For residential and commercial skip bin hire in Westmeadows, contact us at Ultra Bin Hire & Demolition. With a huge range of sizes from small skip bin for a residential renovation or a larger walk-in bins for commercial and industrial sites, we have a range of options to suit your needs and your budget. Once your bin is ready we’ll collect and dispose saving you the hassle of disposing of the contents yourself. If you have a property that is getting out of control with a buildup of rubbish, or you have a vacant block of land that you need rubbish removed then you could consider hiring a skip bin or if you need someone to do the hard work for you, ask us about our rubbish removal services. Our experienced team can help you remove anything from general waste to hard rubbish and building materials and can help you rid your property of unwanted rubbish and debris. Have a building that needs to be properly demolished? Ultra Bin Hire & Demolition is proud to be a leading choice for demolition in Westmeadows with years of experience demolishing structures of all sizes. While we offer ultra competitive pricing, we do not take away focus on getting the job done on efficiently and safely. Whether you need help with a residential or commercial demolition, get in touch with our team today. WHY CHOOSE US FOR BIN HIRE OR DEMOLITION SERVICES? With years of industry experience we know what we are doing when it comes to demolition and related services. We are also well known for our skip bin hire services for home and commercial projects. We strive to achieve high standards of safety and service and pride ourselves on the work that we complete and looking after our customers. 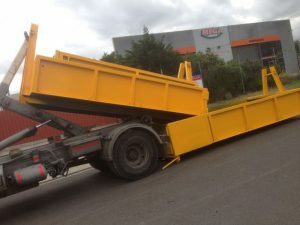 No two projects are the same so whether it’s a demolition project or you are looking to hire a skip bin then talk to us to discuss your needs and we’ll give you the best options with ultra competitive pricing. We’re also happy to provide you with a free quote. Bin Hire Melbourne – We provide a bin hire service to Melbourne and surrounding areas with bins of all sizes from smaller skip bins to large walk in bins. Excavation Services – We can provide professional excavation services to prepare your site for construction. Demolition Services Melbourne – Whether it’s a large building or a small part of a building that needs to be taken down, we can handle it. Asbestos Removal – We’re equipped, skilled and qualified to remove asbestos from your premises. Rubbish Removal Services – Hard rubbish, general waste or debris, our team can handle rubbish removal needs. You could simply hire a skip bin where we deliver and collect the bin when ready or we can even provide you with the full removal service. Site Clean Ups – Have a project that needs a site to be cleaned up before, during or after construction? We provide an environmentally responsible site clean up service.